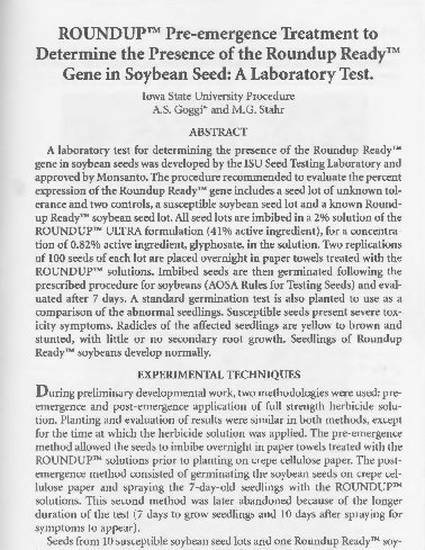 A laboratory test for determining the presence of the Roundup Ready™ gene in soybean seeds was developed by the ISU Seed Testing Laboratory and approved by Monsanto. The procedure recommended to evaluate the percent expression of the Roundup Ready™ gene includes a seed lot of unknown tolerance and two controls, a susceptible soybean seed lot and a known Roundup Ready™ soybean seed lot. All seed lots are imbibed in a 2% solution of the ROUNDUP™ ULTRA formulation (41% active ingredient), for a concentration of 0.82% active ingredient, glyphosate, in the solution. Two replications of 100 seeds of each lot are placed overnight in paper towels treated with the ROUNDUP™ solutions. Imbibed seeds are then germinated following the prescribed procedure for soybeans (AOSA Rules for Testing Seeds) and evaluated after 7 days. A standard germination test is also planted to use as a comparison of the abnormal seedlings. Susceptible seeds present severe toxicity symptoms. Radicles of the affected seedlings are yellow to brown and stunted, with little or no secondary root growth. Seedlings of Roundup Ready™ soybeans develop normally. This article is published as Goggi, A. S., and M. G. Stahr. "Roundup™ pre-emergence treatment to determine the presence of the Roundup Ready™ gene in soybean seed: A laboratory test." Seed Technology 19 (1997): 99-102. Posted with permission.